I normally like to kick off these posts by ticking off another beer from “1001...”, however this weekend I had a cracker from outside the list so thought I'd cover it (and a few others) prior to getting back the the trail! Description: Poured so black it started sucking the light out of the room. Nice tan head. Smells like an awesome coffee shop – coffee, cocoa and toasted malt. Again coffee on the palate, some dark fruits, almost burnt malt, and booze. Slight dark chocolate taste on the finish. Thick mouth feel, with a slightly oily mouth coating (this doesn't sound good but is). Description: Slightly lighter in colour than the Kernel Beer above, but still dark brown. Very small head, but it was a bit of a ham fisted pour by me in fairness. Not much aroma going on, a little bit of chocolate and coffee. Toasted malt taste, with a wee bit of brininess. An unexpectedly light body. Thoughts: I'm a fan of Flying Dog beers (see here and here) but I think I preferred their Gonzo Porter to this. 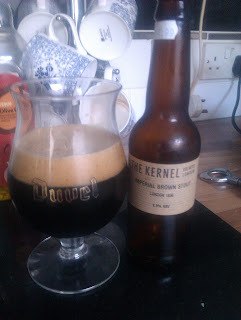 It may have been affect by following the Kernel Brew, and this paled a bit in comparison (and maybe that unfair on the beer, I'll try another bottle and update if required). A little too light in taste and mouth feel for me. Overall, OK. Description: Almost lemon in colour and hazy. A very flimsy head that didn't hang about. Lots of lemon on the nose, slight biscuit notes, and some bitter yeast. Lots of zesty lemon, a little sourness and slightly bitter. Very thin and light mouth feel. Yeasty and dry finish. Thoughts: This is interesting, and it feels like there is a good beer in their trying to get out, but I'm not sure it works as well as it should. Much better than the rather strange sage thing of theirs I tried, but this is just a little too light and too thin for me. Refreshing though. The observant among you, or at least anyone still reading by this stage of one of my posts, will have noted I skipped from beer 76 to 78. Well I also had Macs Gold All Malt Lager – a pale lager that’s not really worth going into detail about: scored 4. Next time we'll be back on the trail of beers from the list, and I have a few ticks already lined up!